Do you want to take instant photos? You could use a digital camera to take a photo and then print it. But, modern instant cameras provide a quicker solution. Polaroid dominated the instant camera market for decades. But, modern digital cameras provided an easier solution for taking instant photos. This doesn’t mean that instant cameras went away. In fact, they’re making a comeback. Both Polaroid and Fujifilm have a variety of great models. These two companies are the only instant camera manufacturers that appear in the following list. This means that you can’t really go wrong with any of these options. If you want instant photos, then browse this list of the top 10 best instant cameras in 2019. You’ll need to purchase the film separately. 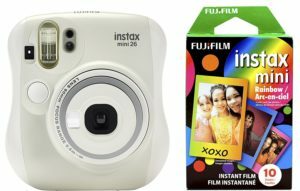 It uses Fujifilm Instax Mini Instant Film. Each pack of the film includes 10 sheets. The film also comes in a variety of styles, with fun designs and accents. The flash and shutter speed are fixed. This to make the camera incredibly easy to use – just like the old Polaroid cameras. You simply point, click, and print. But, you can adjust the brightness, which gives you a little control over the photo. 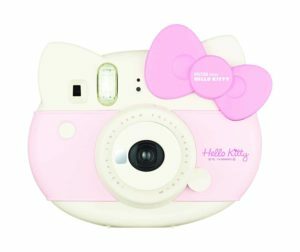 Overall, this is a fun camera with a design that will mostly appeal to Hello Kitty fans. It’s a great example of how instant cameras can still provide fun and entertainment for a new generation. 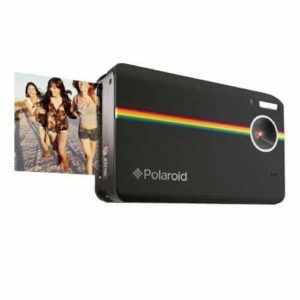 Your next option this Polaroid camera. It takes business card size color photos, like the rest of the options in this list. The photos are about 1.8×2.4-inches on a sheet that measures 2.1×3.4-inches. The fixed shutter speed isn’t a problem unless you want more control over the film exposure. The reason that it is fixed is to ensure quality photos using the automated features, such as the auto flash. Just like the original Polaroid instant cameras, you don’t need to mess with any controls or options. You just point and click. As a side note, this camera uses Polaroid 300 film, which is discontinued by Polaroid. But, there are companies that produce alternatives. Next is another Fujifilm camera. This camera takes wider photos and offers a few helpful features that should allow you to take better photos. Again, the camera doesn’t include film. This is the only potential drawback, but it’s a minor one. The camera also comes equipped with batteries, a camera strap, and a 1-year warranty. The bottom line is that it’s a top choice due to the size of the prints. The 4.25 x 3.4-inch size is larger than the prints provided by any of the other cameras on this list. At number 8 is a 10-megapixel instant camera. This option provides something a little different from the other cameras. Instead of just printing instant photos, you can also store photos on an SD card. The first disadvantage shouldn’t matter too much. You can open the camera to check how many shots you have left. Unlike a standard camera, you won’t ruin the film by exposing it to sunlight. The main problem is the quality of the photos. They are clear, but not what you’d expect from a 10-megapixel camera. Essentially, you’re getting a digital camera, instant camera, HD video camera, and a color printer in one. But, if you’re purchasing this as a digital camera, there are better quality choices for the same price. While the quality isn’t on par with a 10MP camera, it is on par with the other instant cameras in this list. The quality of the photos isn’t great, but this doesn’t mean that you should eliminate this camera from your considerations. It is a fun product and this is one of the only cameras in the list that comes with instant film. This way, you can start snapping photos instantly. Another Instax camera, this option automatically detects the brightness of your surroundings and then adjusts the flash and shutter speed to provide better photos. You can’t rely on the automated light detection to help you take great pictures. You should still follow the basics of good photographing – make sure that you have plenty of light and take your time to compose the shot. Overall, this camera is another good choice for anyone that wants instant photos. The various photo modes give you more options than the earlier choices and the film isn’t too expensive. 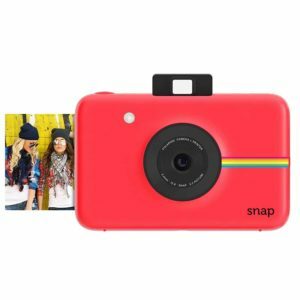 The Polaroid Snap uses ZINK Zero ink printing technology to produce full color 2 x 3-inch prints in less than a minute. It also features a 10MP digital camera for taking digital photos which can be uploaded to your photo or transferred to the ZINK Instant Printer. There are other cameras that combine instant printing and digital photography. With other dual-purpose cameras, you can choose whether to store a photo that you take or print it. With this camera, it automatically prints after you take a shot. The bottom line is that this is a high-quality instant camera, as far as instant cameras go, but the automatic photo isn’t the greatest feature. 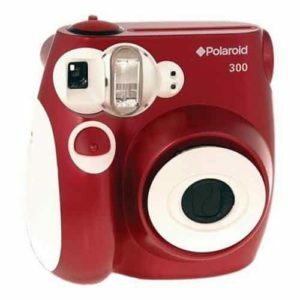 Your next option is this Polaroid 300 Instant Camera which works with Polaroid 300 instant film. For those not familiar with this film, it’s the standard instant film that was used in the old Polaroid instant cameras. While Polaroid no longer produces that film, other manufacturers now produces compatible options. These other options include various colors and fun designs for the borders. The automatic flash and electronic shutter can be helpful. This means you don’t need to worry about adjusting any settings. But, this also doesn’t always result in the best photos if you’re in a low-light setting. In the end, this camera is a throwback to the earlier Polaroid cameras. It even uses the same film. This gives you a great way to enjoy the classic tradition of instant photos. Next is another Instax Mini. It’s decently priced and available in a variety of colors. This is an update to a previous Fujifilm camera and features a slimmer and lighter body. By now, you’ve noticed that a lot of these cameras shares these two issues. They don’t come with film unless you purchase a bundle package, and the flash and shutter speed are fixed. The latter helps make the camera easier to operate. This camera is like the previous entry. They have similar designs. But, the Fujifilm is more popular and garners more praise from customers. People enjoy the ease of use and the high-quality photos that it takes. Again, you’ll need to purchase the film separately. This is slightly inconvenient, as this is one of the most expensive cameras on this list. But, with a higher price, you get plenty of extra features. This includes the selfie mode and mirror, along with the macro and landscape modes. If you want the best, you sometimes need to pay a little more. Modern instant cameras provide a variety of features that weren’t available with the original Polaroid cameras. You can now find wide-angle cameras, cameras with photo filters, and more. 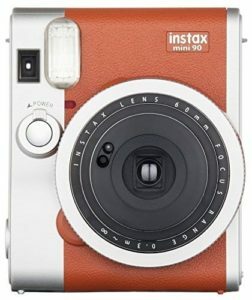 Compare the products featured in this list of the top 10 best instant cameras in 2019 to find the right camera. The instant camera industry has been dominated by a couple of manufacturers which just destroyed their competition. There are still some smaller brands that manufacture instant camera but for most part everyone owns a Polaroid or Fujifilm instant camera. They do have quite a few models in their lineup to choose from and some are better than others. Classic models that were introduced some time ago are still being manufactured due to the fact that their quality is still up to par by today’s standards. With no further ado here are the top 10 best instant cameras in 2017 reviews. The Polaroid One Step Close-Up 600 instant camera is a classic model that some might still remember. It is still popular due to its picture quality and convenience. The model uses replaceable cartridges that are easy to replace. It actually uses Polaroid 600-type film which is compatible with several other models. The One Step Close-Up also comes with a simple design that makes it quite intuitive to use but it is fairly large when compared with other models. 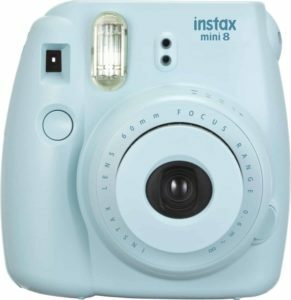 For many the Fujifilm Instax Mini 8 might seem like a toy. 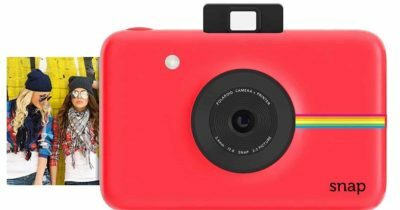 It is an instant camera with a playful design and a compact form factor. It has a slimmer body when compared with other generations while still providing the same picture quality. It has an advanced sensor that automatically recommends the aperture setting and LED flashing which makes taking perfect pictures a lot easier. 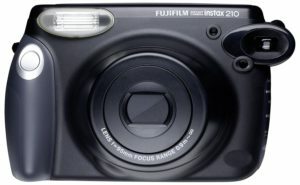 The Fujifilm Instax 210 is an affordable instant camera that comes with basic features which makes it easy to use and straight forward. It has an LCD panel that can display focal distance and can show the film count while the shutter is controlled electronically. The model uses an automatic flash and comes with two-range shooting options. In terms of form factor the model is fairly large and requires four AA batteries to operate. 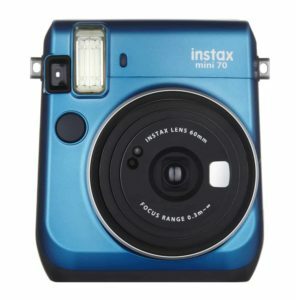 Fujifilm Instax Mini 7s Trim is a great starter kit and an affordable option for the ones that did not own an instant camera before. The kit comes with the camera, four AA batteries to get it running and a film to start taking pictures right away. Its standard film offers 10 shots which is fairly decent for its compact size. Picture quality is quite impressive and can be compared with other much more expensive models. The Fujifilm Instax Mini 90 Neo Classic instant camera was made to look like a classic device. It has a leather texturized finish on the outside and a compact body. The model uses an automatic flash and comes with a tripod socket. It also allows the users to control various settings such as lighting, brightness and focus. Like most other models it runos on regular AA batteries and it is relatively easy to use. Lemography Diana F+ is a classic instant camera that survived the test of time. It is one of the more expensive models that comes with a classic design including a large flash. The model includes a close-up lens attachment and features two speeds for the shutter. It is easy to operate and replace the film while still providing excellent picture quality despite being a classic model. The Polaroid One 600 Ultra instant camera is one of the newer models developed by the manufacturer. It comes with several useful features including automatic flash and instant photo gratification. The model uses focus free lens that enable close shots of objects just two feet away. It comes with a simple LCD screen on the back that allows picture selection and uses standard Polaroid 600 film. Instax Wide 300 from Fujifilm is a great camera for the ones that cannot settle for a standard model. It actually comes with special lens that can provide wide pictures of crisp clear clarity. The model uses an advanced optical viewfinder and comes with a tripod socket. Using digital editing the model allows the user to control brightness, low-key effects and colors to make every picture look as good as possible. 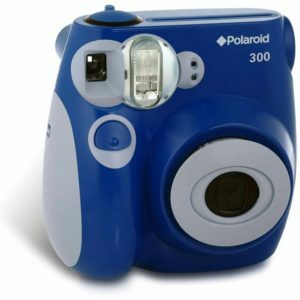 The Polaroid 300 instant camera is a great choice for the ones that did not own a similar model before. It comes with several features that make it easy to print perfect pictures such as scene settings, flash settings and focus adjustment. The model uses standard Polaroid 300 instant film and comes with an advanced electronic shutter. It has a compact form factor but most importantly it is affordable. The Polaroid Z2300 represents the new generation of instant cameras which no longer use traditional film. It is basically a compact camera with a tiny photo printer inside. Surprisingly the model is still quite compact. What this means is the fact that pictures are digital and as expected the model offers more editing and cropping options before printing out something. It comes with a 3 inch color LCD display and supports memory expansion with SD memory cards. The vast majority of instant cameras still use traditional film. Newer models gave up on film and introduced digital instant photography. The traditional ones still compete with digital photos in terms of details but they also lack several features to control picture quality. Overall our top 10 includes a vast selection of instant cameras for every single budget so that everyone can pick a suitable model.